You'll feel transported back in time to old Portland walking under massive old trees lining Irvington’s streets, listed in the National Register of Historic Places. Almost every home in the Irvington Neighborhood is a stunning example of classic Portland home styles, from stunning renovated updates to fixer uppers with a lot of charm. Although the neighborhood is near the bustle of Lloyd Center, Broadway, and Martin Luther King Blvd, it's quiet and the sidewalks are wonderful for peaceful evening strolls. By day you'll find kids playing in the lush green yards and happy residents walking their dogs to a local coffee shop. The southern section of the Irvington neighborhood along NE Broadway has has been completely reinvigorated over the last few years, drawing comparisons to the trendy areas of NW 23rd and 21st Avenues with its amazing restaurants, posh boutiques, and health food stores. Irvington provides the amazing combination of safe streets, gorgeous historical homes, urban walkability, and easy acces to the rest of Portland. There are several gorgeous parks in the neighborhood, though many residents have their own park-like lawns with gorgeous trees that date back to Portland's earliest development. The Irvington Addition was platted in 1887 and underwent its initial development in the 1890s under the oversight of developer Ellis Hughes and the Irvington Investment Company. The Irvington neighborhood is named for Captain William Irving, a steamboat captain of renown from Scotland. The addition was planned as a self-contained middle to upper class residential district in which commercial activity was to be prohibited, so as to maintain property values. 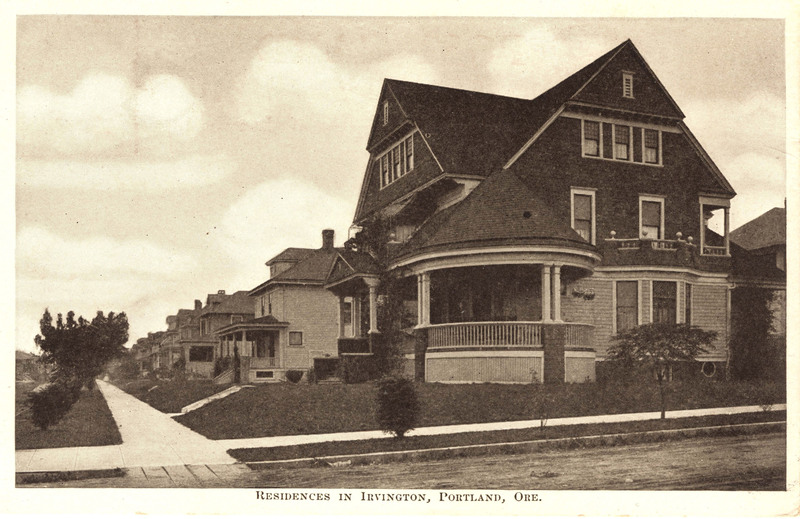 After a period of nominal growth, development in Irvington began to slow due to competition from the Rose City Park and Laurelhurst developments nearby, as well as the outbreak of World War I, and has remained a beautiful example of pre-war Portland development. The Irvington School south of Brazee at 13th and 14th (1320 N.E. Brazee) was originally a wooden two-story structure that was built in 1905 near its current location. The brick building at the current location was built in 1932 and opened in 1933. The Irvington Community Association began in 1965 in an attempt by a group of community leaders to response to the deterioration of the neighborhood. The neighborhood was added to the National Register of Historic Places as the Irvington Historic District in 2010. The Irvington neighborhood is located in the Northeast section of Portland, and takes up a rectangular area extending east to west from NE 7th Ave. to NE 26th Ave., and north to south from NE Fremont St. to NE Broadway. Major freeway ramps located near Irvington include I-84 and I-5. Portland’s Tri Met runs bus schedules, and the MAX light rail train is only blocks away from Irvington’s Southernmost boundary, at Lloyd Center Mall. Drive west over the Broadway bridge to get downtown or to the Pearl District in mere minutes, or head Northeast to Alberta or Beaumont-Wilshire, Northwest to the Boise/Eliot and Historic Mississippi Avenue neighborhoods, or Southeast to get to the Belmont and Hawthorne neighborhoods. The Irvington neighborhood borders the King, Sabin, and Alameda neighborhoods to the north; Alameda and Grant Park to the east; Sullivan's Gulch and the Lloyd District to the south; and Eliot to the west. Irvington is served by Irvington Elementary School, Fernwood Middle School, and Grant High School. The current real estate market housing stock in Irvington varies from older mansions, to modest family houses, to apartments along the southern edge. Irvington home styles range from classic Old Portland architecture, Craftsman bungalows, Victorian two-stories, Tudor cottages, Foursquare homes and more. The houses along Tillamook and Hancock as well as the houses at 15th and Knott Street best symbolize the richness of the early residences, and the nicest homes are located towards the north end of the neighborhood, near NE Fremont. About half of the housing was built years ago between 1920 and 1939, most of the rest are even older. This exquisite and historic community center is the site of the former Eliot Grade School, taken over by Portland Parks and Recreation in 1950 and remodeled. Named after Portland’s first African American Multnomah County police officer and sheriff, the community center includes a basketball court, fitness room, gymnasium, and meeting room. People can also reserve a party room or stage, swim in the indoor L-shaped swimming pool (with a one meter diving board) or lift weights in the weight room. Installed on the lawn in front of the center, is a pavilion sculpted by Jon Gierlich in 1996, aptly titled Angle of Repose. And when you’re all done and want to relax, sit in the 102 degree spa for a spell! The Irvington Home Tour is a great way to explore the historical side of Irvington, and raise funds to exclusively support local charities and different neighborhood projects. Residents show pride in the neighborhood by opening up their homes to visitors. A ticket ensures you a map of all the locations, descriptions of sites along the way, and explains what you will see in each home. Volunteers are available to answer questions, and are knowledgeable about each home and its respective features. In sometimes rare but nice weather, it’s a wonderful walk between homes. Irvington Park - This is a popular old park for Irvington residents, with big trees, plenty of green grass, ball fields, a water feature and playground for the children, and off-leash dog park section, basketball and tennis courts, and of course, picnic tables. Lloyd's Center Mall - This popular shopping mall has all the stores and restaurants you'd expect from an urban shopping center, with the bonus of an indor ice skating rink, home to open skating and ice hockey year-round! 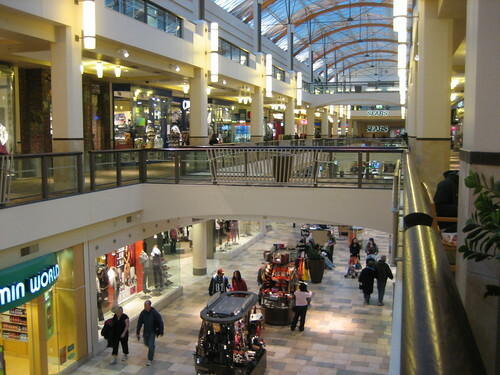 The mall anchored by Macy's, Nordstrom, Sears, Marshall's and JCPenney, features three floors of shopping, a food court, and an indoor Regal Cinemas multiplex. Another Regal Cinemas multiplex is located across the street. The Kids Edge - 2200 NE Broadway St - This is the place to buy clothing or gifts for the coolest kinds in your life. The store specializes in skate and rockabilly clothes for kids and teens. Kids Edge features young artists and give them a venue to sell their work. Whether it be their music, jewelery, clothing or artwork there is no limit to their creations! Costello's Travel Cafe - 2222 NE Broadway - Owned and operated by the Costello family, Costello's Travel Cafe is warm, inviting, and full of character. With a vibrant, old-world atmosphere, it's not surprising that Costello's has become a neighborhood favorite and a destination within the Portland area. While the unique environment is quite distinctive, it's the great food and attentive service that have earned the loyalty of Costello's customers. Rose and Thistle Pub - 2314 NE Broadway - This traditional English pub is the ideal place to pick up some fish & chips, grab a pint with some friends, and soak in some great ambiance. The booths are cozy, the beer is good, the food is filling and delicious, and the servers are great! At Arabian Breeze, traditional favorites from Syria, Lebanon, and the Middle East aren’t only remote lands on the news, but homes and hearths. They are sure to please many, as they have vegan and vegetarian selections along with classic cheese and meat dishes. The flavors selected from so many homecooked and authentic favorites are sure to please any palate. The Pacific Northwest has a new standard for Thai food. Opened in 2000, Sweet Basil Thai offers a taste of Thailand with an elegant twist. Look for their weekday lunch specials, their exceptional dinner menu, or check out the basement’s “Basil Bar.” One is free to choose their desired spice level, from Very Mild to Extremely Wild, and every October hosts an annual Spicy Contest. This restaurant is known for its house sauces, especially the delicious peanut sauce found in the House Curry, served alongside the Fresh Wrapped appetizer. Also, look for the black and white Jasmine rice served in the shape of a moon and star with the curries, stir fires and house specials. Great service, bright colorful velvet paintings, and a small enough atmosphere to hunker down with friends in, Thatch Tiki Bar is not your usual tiki bar. Some may call it over the top cheesy with the grass thatched ceiling and wall space, low lights, tiki idols everywhere and dried blowfish, but the drinks are wonderfully concocted. In fact, let the bartender know your preference and their imagination will run wild with drinks sure to satisfy and impress. Try the real crab wontons, bbq pork, ribs, spring rolls…every bite is as tasty as the last.